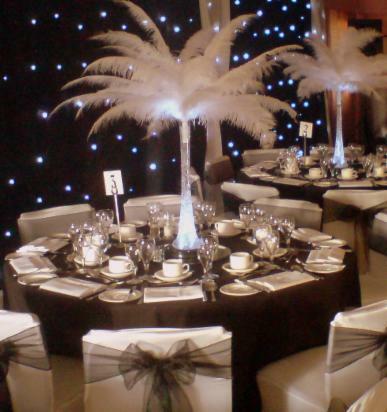 WOW your guests with these stunning Ostrich Feather Centrepieces! 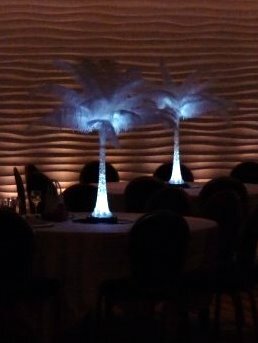 If you're looking for something a bit different for your wedding or special event, these Feather Centrepieces will really make a statement! 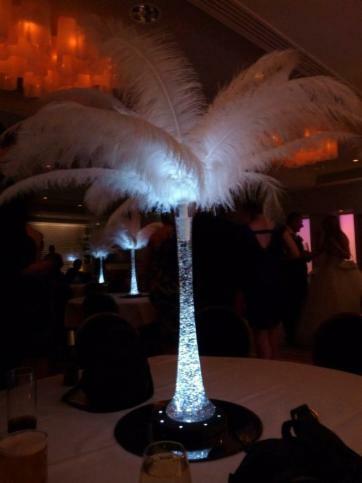 Each one consists of 20 White Ostrich Feathers arranged in a tall glass vase, filled with 'crushed ice effect' gel. Each vase stands on top of a light base, with 13 super bright LED lights to illuminate both the vase and feathers. These look stunning when the room lights are lowered during the evening. The light bases are cordless, and stay illuminated for approx 8~10 hours. A table mirror is placed underneath to reflect even more light. 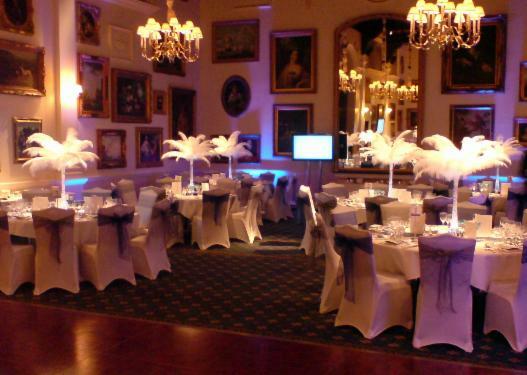 Illuminated Ostrich Feather Centrepieces with Close Fit White Chair Covers and Silver and Navy sashes. Depending on our availability, we are sometimes able to deliver, set up and collect from venues in South West London, Middlesex, Berkshire, Hampshire, West Sussex & Kent, but extra delivery and collection charges will apply. Please contact us for further details. 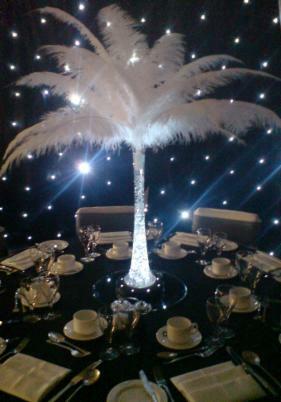 A damages deposit of £30.00 is payable on each centrepiece out on hire. The replacement cost of any missing or damaged items will be deducted from your deposit.